At Therapy Duo, in Couples therapy, we often take a psycho-educational role and offer very practical tips for resolving couple conflicts. But we are also always aware of another level operating in the couple relationships we see. This level can be hard to pin down and define, and yet we as therapists often have a real sense of its presence and how it might be accessed furthur to transform a relationship. In this blog post we will try to say a little about this other level. Culturally and educationally, society is swayed by a scientific view of things. The rise of science since the end of the seventeenth century has been extraordinary, and no-one would deny the tremendous gains that have come from this. Science is an exacting lens on nature, a champion of the “cause and effect” paradigm (i.e. that all effects have causes, which are previous to them in time). Science has brought about amazing devices such as our computers and smartphones. It’s interesting to note though, that at about the time of the beginning of the rise of science, another world view was dying out in the West. This was the world of (Western) alchemy, and it works in an opposite direction to science. While science was starting to become a study of material life, and how matter changes over time (by a disembodied subject), alchemy was always a science of the soul. Although some still see alchemy as just a primitive version of chemistry, other current thinking is that in fact they were diametrically opposed disciplines, in their intended goals, operating within two markedly different paradigms. Science wants to (and has been very successful at) demarcating a split between subject and object. It enables subjects (people) to successfully manipulate objects (nature). Yet, with science we are at a crossroads now: this process cannot continue unabated without destroying the earth, through climate change and species extinction. We could say that science has been a victim of its extraordinary success. Some commentators are now starting to look closely at Western alchemy again, and to wonder whether in fact we threw too much out when we assigned it to the dustbin of history. For what was it trying to do? Alchemy insisted that subject and object are always linked (evidence that quantum physics is now corroborating); that soul exists as an inner life that moves by its own rules, independent of cause and effect, independent of time. That synchronicities exist, and that they order reality. And that this discipline is a proper subject for psychology (for psyche, soul). Alchemy liked to keep this idea of relationship living by considering the subtle body. This was the third element, the realm between two opposites (such as matter and soul, subject and object, two people in a relationship) and it had a reality as an intermediate realm. We are suggesting again in this post that there is good evidence for taking the concept of “The Third” very seriously in couples work. We see this play out in the therapy room sometimes when two people, who have been attacking each other (and continually defending themselves), are able to “stand aside” and watch the life of “The Third”, in the room, at that moment – and for them to realise that they have this important Third on which mutually to work – which is the Relationship itself! We in the therapy room can then sometimes all detect a change that happens; there is a sense of rightness and of hope for transformation. Which, of course, was what alchemy was all about, the transformation of opposites to form a higher state, neither inner nor outer (which science would insist be one or the other!) but of a third realm: the “subtle body” of the relationship. We could argue that due to our very scientifically-oriented culture we are sometimes doing relationships under duress. There is potentially a large part of the world of relationships for which an effective language of discourse no longer exists. And the right words are often needed before the deeper experience can be had. It may be better to stand back in couples work, from love vs hate, attack vs defense, good vs evil, mind vs body, left-brain vs right-brain, love vs power, and sit with the alchemical idea of essence, something that pervades all of reality and connects the opposites; something that can have real presence in couples work if it is allowed in. Couples work could then be a microcosm of what we must also do collectively in the outer world, as we find new paradigms to save the planet from destruction; paradigms that see ourselves as part of the one subtle body of nature, rather than as subjects exploiting nature. The image at the top of this post is Plate 2 of the Rosarium Philosophorum, an alchemical text that was a favourite of C.G. Jung, and that describes stages in a relational alchemical process (either between two people, or between two parts of an individual). Plate 2 shows the start of the process. (There are 20 plates.) The image is sometimes referred to as the “Left-handed Contact”, because the couple hold hands with their left hand: they are unconscious of much of their connection (a situation which can be fraught with difficulties). We say in this situation that the Family of Origin issues that the two people have brought into the relationship are alive and activated (and are often out of their awarenesses). 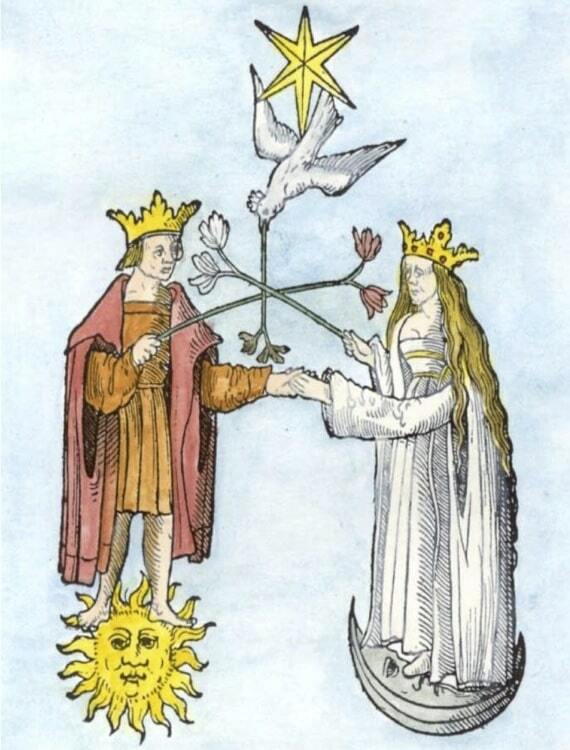 Yet, some kind of structure is already in place (the crossed branches), and a holy dove is shown descending: some kind of illumination is possible, but is not yet in effect between the persons of the relationship. There is hope!